It is usually one ingredient that gives me the inspiration for what I cook. Whenever I go to Chinatown which isn’t very often these days as I live and work 100 miles from London I use the opportunity to stock up on Asian ingredients. Green papaya and green mango are never available in my local Asian supermarket so they’re always on the list. The papaya lasts for a few weeks so the mango was to be the star ingredient or so I thought…. The plan was to turn it into a Vietnamese salad. As that is pretty light I decided to also make some spicy minced pork balls with nuoc cham dipping sauce and as a canape, Anna Hansen’s Krupuk Quails eggs with chilli lime dipping sauce. For the main I made Thit Kho Chien; a take on a dish we ate at Le Colonial in San Francisco which despite emailing them for the recipe numerous times I still haven’t had a response, marinated and grilled salmon and pineapple rice. Seemed like a great idea however it was too much for a couple of hours so what should have been the quickest and final dish, the green mango salad got the boot! I’ve wanted to make these little beauties for ages. 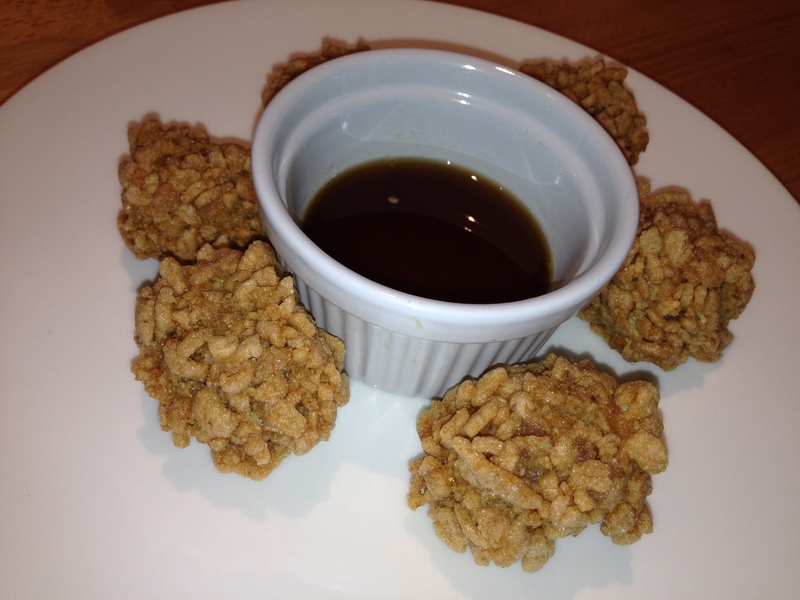 A take on a scotch egg however the coating is blitzed raw prawn crackers. I think they could have done with blitzing more as they look like they’ve been coated in rice crispies, however they tasted amazing. A runny yolk is key so stick to the cooking times and as you are putting the eggs straight into hot water there may be some casualties. Cook the quail eggs for 2.5 minutes in boiling water. Refresh in cold water for 3-4 minutes. Peel and set aside. To make the dipping sauce put the juice and an empty lime half into a pan with the remaining ingredients. Bring to the boil and simmer until syrupy. Remove from heat and set aside. Tip the krupuk crumbs into a bowl, the flour into another and the eggs a third. Lightly dust the quails eggs with the flour, dip into the whisked egg then roll in the crumbs. Once all coated chill for 30 minutes then repeat the process. Refrigerate until required. Heat some rapeseed oil in a large deep frying pan or deep fryer and deep fry the eggs for about a minute until puffed and golden. Drain on kitchen paper and serve immediately with the dipping sauce. To make the dipping sauce, bring 60ml water to the boil with the rice vinegar and sugar, then allow to cool. Mix in the chilli, garlic, lime juice and fish sauce. Set aside. Dry roast the peanuts in a heavy pan over a medium high heat for 3-4 minutes until golden brown. When the nuts are cool, coarsely chop them. Set aside. Mix all of the meatball ingredients together and roll into small balls. 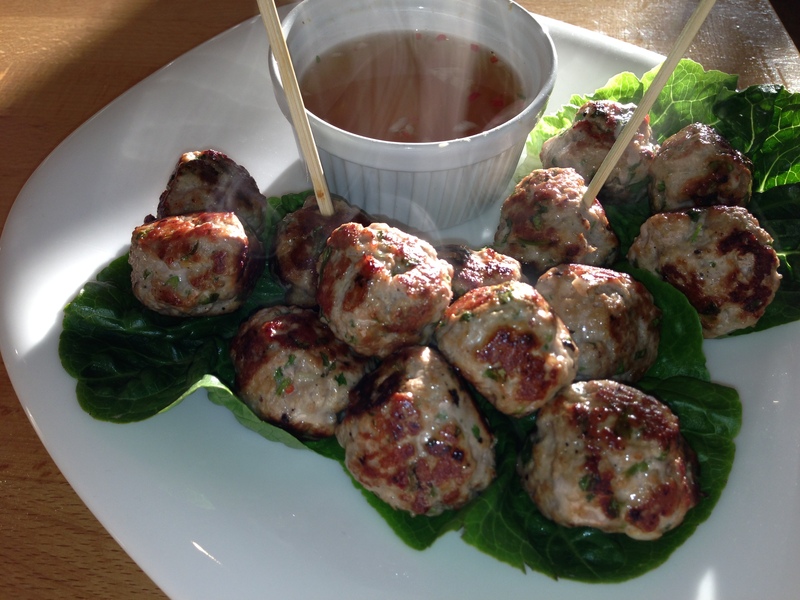 Heat a couple of tablespoons of oil in a non stick frying pan and fry the meatballs on all sides for 4-5 minutes. Serve with the dipping sauce and scatter with the peanuts. Smash the lemon grass and finely chop and mix it with the soy sauce, coriander stalks, ginger and garlic then rub all over the salmon fillet. Leave it to marinate for an hour or so, either in a plastic bag or on a tray covered with cling film. Preheat your grill to its highest setting. When you’re ready to cook the salmon, remove it from the marinade, brush with honey and grill for 10 minutes. 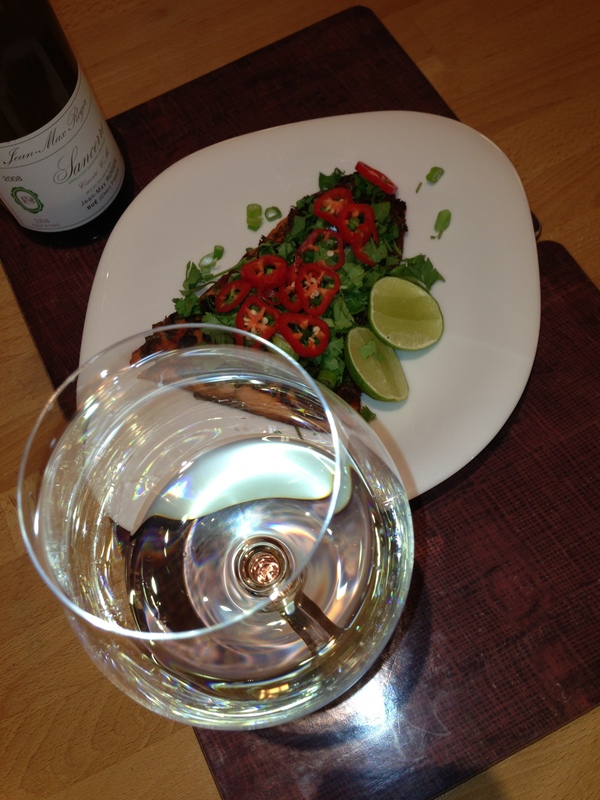 Serve sprinkled with the chillies, spring onions, reserved coriander leaves, then squeeze over the lime. Remove the meat and star anise from the dish and liquidize the liquid then recombine. If the sauce seems thin, reduce until a gravy consistency is achieved. Heat the oil in a wok and when hot fry the onion for 2 minutes. Add the garlic and chilli and fry for another minute. Add the turmeric and fry for 30 seconds before adding the prawns. When the prawns start to turn pink add the pineapple and continue to cook for 3 minutes. Season with the soy sauce then stir through the coriander and spring onions and sprinkle the shrimp floss on top. Despite my comments in an earlier post about my Viognier intolerance, a glass of the same was put in front of me whilst cooking the meal. When I protested I was assured that it wasn’t Viognier so I briefly had the fear that another grape variety had bitten the dust. When the bottle was finally produced it was as I thought – Condrieu, however we were chowing down on the quails eggs and the two were a match made in heaven, as were the pork balls and Thiet Kho Chien. The salmon needed something a bit more refined , despite the red chilli garnish, so we moved on to a Sancerre which the eagle eyed among you may have spotted in the back of the photo above. Fermented and aged in steel tank with malolactic fermentation blocked, this is therefore a very lively juicy style of Condrieu with all of the floral exuberance and fat that you would expect of this unique appellation. 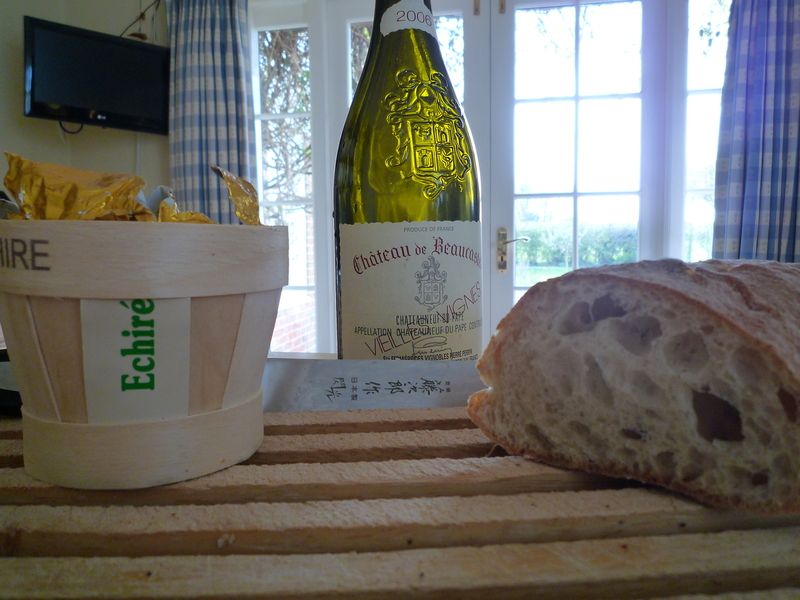 One of Rostaing’s best Condrieus for a long while. Floral, stone fruit, hints of crème de peche, there’s plenty of fat and richness here to balance the really lifting ruby grapefruit freshness, really intense stuff, excellent. The “C.D.” cuvée is made from Sauvignon Blanc grapes that come from four vineyard parcels that occupy an area once called “Clos Derveau”. The soil here ranges from fine, soft limestone subsoil to hard, very pebbly limestone on the surface. With varying proportions of clay, this is typical of “caillottes”. Though these vines are planted close to those that produce grapes for the “Cuvée G.C”, the resulting wine stands out for its more assertive fruit and structured personality. Its distinctive fruitiness sets this cuvée apart from all of their other cuvées. It is fine, fresh, and fruity on the palate. This wine may be enjoyed on its own, at any time of day, or as an aperitif. It is the perfect complement to the bounty of the sea, including crustaceans, shellfish, and raw or cooked fish. It is also a good match for white meats (poultry, veal) as well as for cheeses, goat’s cheeses and blue cheeses in particular. Categories: Food | Tags: Anna Hansen, Asian, Chinatown, Condrieu, Green mango, Green papaya, Jean-Max Roger, Krupuk, La Bonnette, Le Colonial San Francisco, Nem Nuong, Nước chấm, Pineapple rice, Quail eggs, Rene Rostaing, Salmon, Sancerre, Sancerre "C.D. 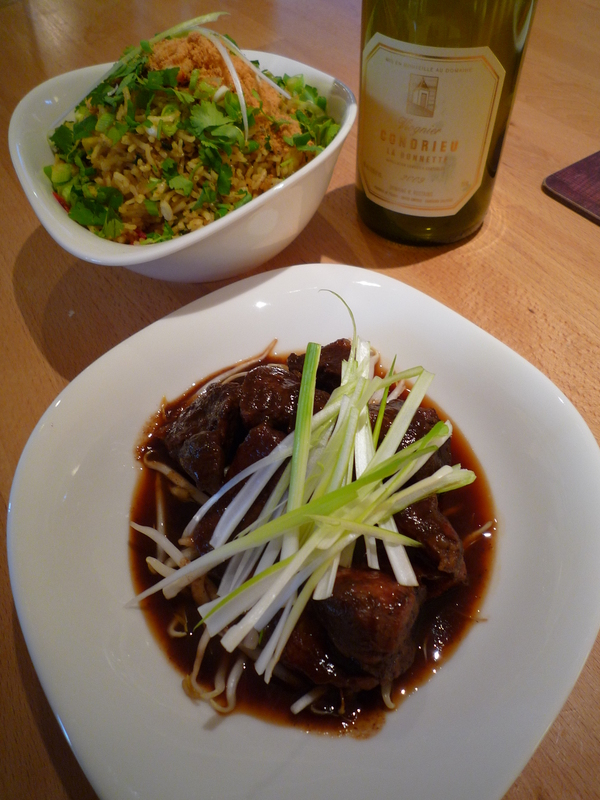 ", Shrimp floss, The Modern Pantry, Thit Kho Chien, Vietnamese, Viognier | Permalink. Following on from the overall success of last weeks fish fest, I thought if it ain’t broke don’t fix it. Fortunately i’d got some home made gravadlax in the freezer so only had to come up with a main and dessert (obviously not fishy!). I got some nice big plaice fillets and clams from Waitrose however despite a pretty large recipe book collection couldn’t find anything inspiring (sounds like an excuse to buy some more books), that was until I went back to Gourmet food for a fiver. Using Bourride of pollock as the base of my recipe I manage to seize victory from the jaws of defeat. There was no tweaking dessert – not having a sweet tooth, and usually being fairly well oiled at that point of a meal, I tend to go for something pretty simple and having not done a huge amount of baking in my life, stuck to the recipe. 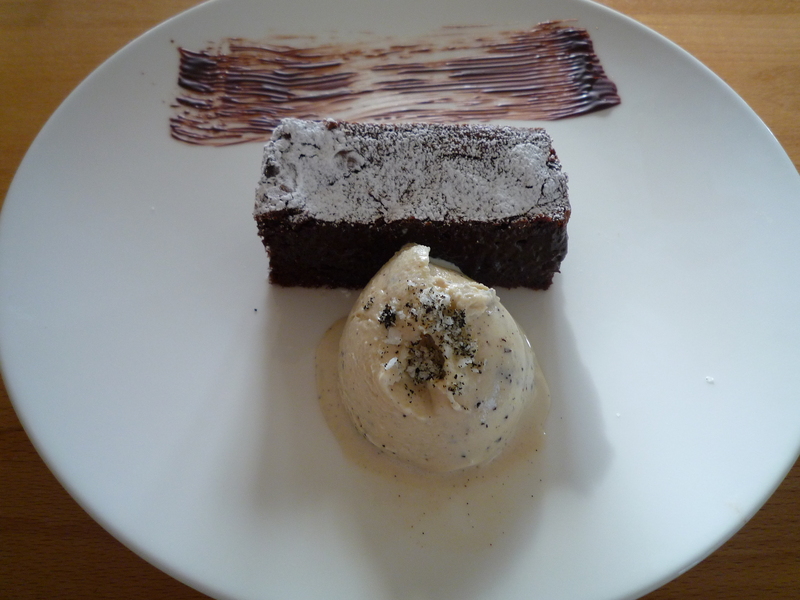 Again, Gourmet food for a fiver came to my rescue and I made the chocolate brownie. Maybe brownies are meant to be really chocolately – I think I can safely say that I have never eaten one before. Boy, I felt like I had overdosed on the stuff, and can see how people get hooked on it. 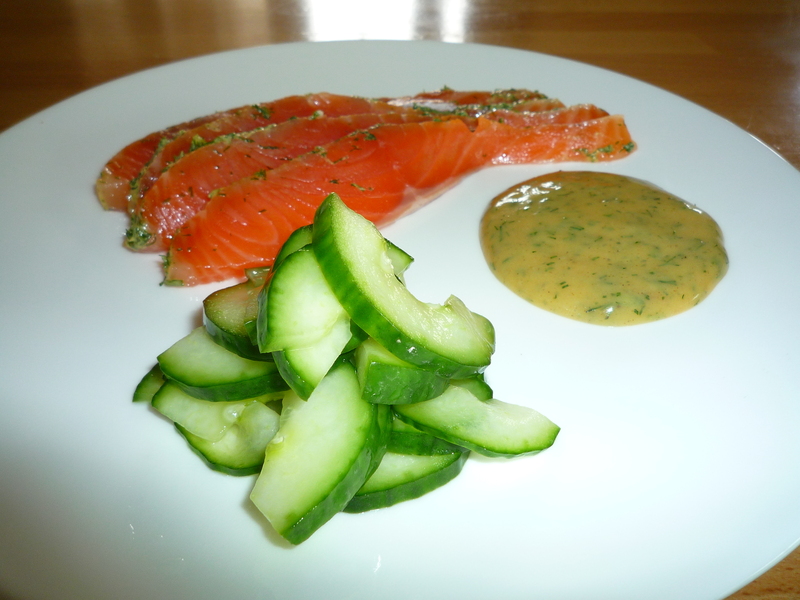 To go with the Gravadlax I made pickled cucumber, mustard and dill sauce and Bentley’s soda bread – the black treacle in Richard Corrigan’s soda bread makes a huge difference to the flavour however I halved the amount of salt – 10g is far too much. We served it with a 2009 Belondrade Y Lurton from Valladolid in Spain. 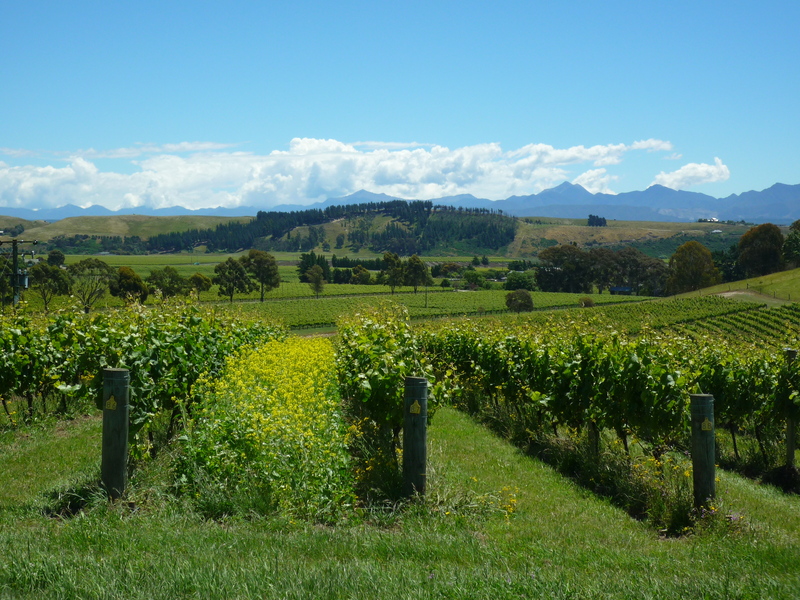 We had a private tour and tasting at the vineyard a couple of years ago, which is where the picture at the top of my blog came from – it’s made from the labels of their wines. This wine can be drunk straight away or aged for up to 10 years, which gives a completely different experience. It’s 100% verdejo and has lovely honeyed qualities. On to the Bourride. It’s basically fish in a sauce that looks very similar to a bouillabaisse. It is thickened with an aioli which my garlic was a bit past its prime for, so I substituted wild garlic which is beginning to come out in the garden. Made with our own eggs it gave a great density, not to mention colour to the finished sauce. We served it with a 2010 Wine & Soul guru from the Douro valley in Portugal. It is a blend of Viosinho, Códega, Rabigato and Gouveio, and has a smooth and ripe lemony nose. Finally on to the death by chocolate. It was topped with a vanilla salt and it is true what they say – salt really does bring out the taste of the chocolate. As Greg Wallace would say, it was like a great big gooey, chocolatey snog! I served it with a Wattleseed ice cream – i’d like to say i’d made it however I ran out of time so mixed a pinch of coarsely ground wattleseed into a couple of scoops of Green and Black vanilla. It has a very distinctive chocolate, hazelnut, coffee taste, a pleasant texture and comes from the seeds of a type of acacia tree found in Australia. 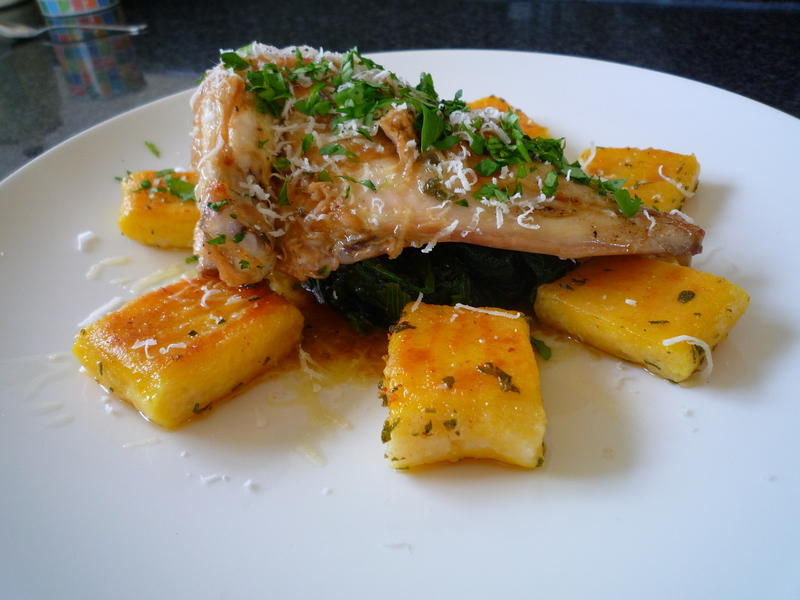 We served it with a 2005 Crociani Vin Santo di Montepulciano. As i’d used a 67% dark chocolate it was quite bitter sweet therefore didn’t need an overly sweet dessert wine. Clean the clams under cold running water. Rinse the plaice fillets and pat dry. If you have both fillets from one side cut in half lengthways. Starting from the tail end, roll up the fillets and secure with a cocktail still. Cover with cling film and set aside in the fridge. Heat the oil in a large saucepan over a low heat. Add the shallots, red pepper and celery and fry gently for 5 minutes or until softened. Add the saffron, chilli and orange and cook for a further 3 minutes. Pour in the chicken stock and bring to the boil, then reduce the heat and simmer for 3 minutes. Add the plaice fillets, put a lid on and cook for 4 minutes. Add the clams and cook for 2 minutes, or until open. Take off of the heat and carefully remove the fish and clams and keep warm. Discard any clams that don’t open. Blitz the broth in a blender until smooth and slowly add the aioli. When the mixture thickens pour back into the saucepan and add the chives. Warm gently and whisk with a balloon whisk or hand blender. 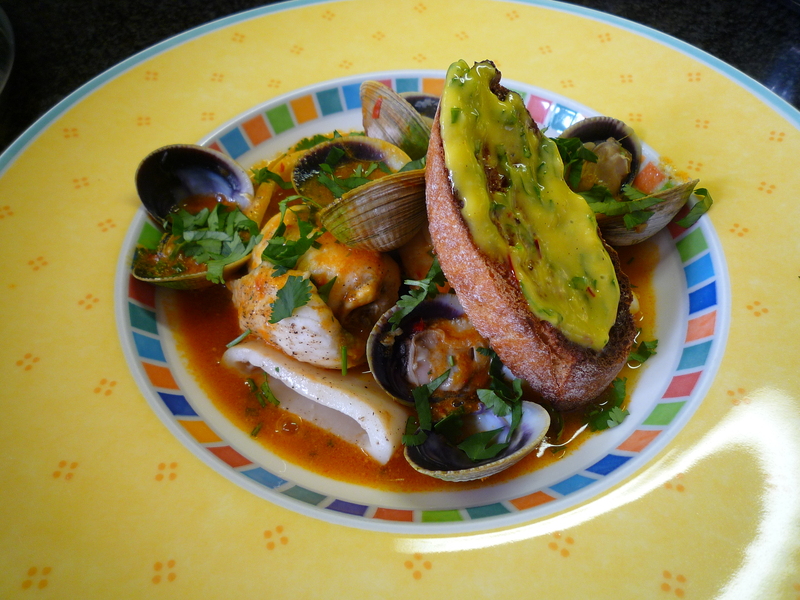 Arrange the plaice and clams in a warm bowl on top of the samphire then pour the broth over and around. Place the toasted baguette, spread with some aioli on the side and sprinkle with chopped coriander. Put the saffron and egg yolks into a bowl and whisk. Preheat the oven to 180c/Gas 4. Grease a 20cm square baking tin and line with baking parchment. Grease the parchment with butter. Melt the chocolate and butter together in a heatproof bowl over a pan of simmering water. Sift the flour and cocoa powder together into a small bowl. Whisk the eggs and sugar together until pale and thick, about 7-10 minutes. Carefully fold in the flour and cocoa mixture. Pour in a quarter of the melted chocolate mixture and fold together. Repeat until all of the chocolate is incorporated. Pour the mixture into the prepared tin. Bake for 15-20 minutes until the top is firm to the touch. Leave to cool in the tin on a wire rack. For the vanilla salt, put the salt into a small bowl. Scrape the seeds from the vanilla pod and add to the bowl. Mix with the salt. When cool, lift the brownie from the tin, and cut into slices using a serrated knife dipped in hot water. Categories: Food | Tags: aioli, Belondrade Y Lurton, Chocolate brownie, clams, Jason Atherton, Montepulciano, Plaice, Vin Santo, Wattleseed, wild garlic | Permalink. “We need to eat more fish” is a phrase that I regularly hear from my other half. We live pretty close to the coast in East Anglia so it’s a crime that we don’t however access to good quality fish is limited. Or that’s what I thought…. Following an early morning trip to Maldon at the weekend I made a diversion on the way home to the Little Fish Shop in Kelvedon. I’d been there once before however the selection was limited so I never went back. If i’d put two and two together I should have realised that visiting a good fishmonger in the afternoon equals an empty display. Arriving at 10am I pretty much had the pick of their catch and came away with some amazingly fresh mackerel, lemon sole and scallops. So how to do justice to my bounty? I love mackerel any way it comes. When it is super fresh you can’t beat it raw however that isn’t something you see very often. Jason Atherton’s Mackerel tartare with avocado puree absolutely hit the spot. It was meant to be served with pickled mooli however I couldn’t find one and don’t think it was detrimental to the overall dish. We drank the Greywacke SB with it and I can happily say that I was briefly transported back to that summer moment (see previous post). The scallops needed to be good as the last time I cooked them probably five years ago, they were such a miss that Mark hasn’t been able to face them since. 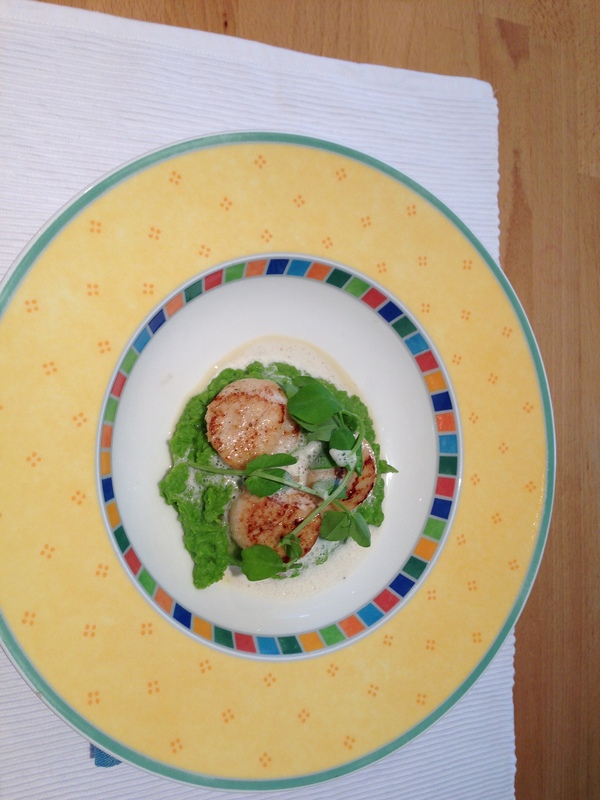 A classic combination is with cauliflower however as that was my previous failed combo I went for peas instead – Chris Horridge’s Scallops with pea puree and cumin foam. Wow and scallopgate is thankfully a long distant memory. We drank a 2004 J Boillot Puligny Montrachet which started a little muted but developed some lovely pineapple flavour. Finally the lemon sole. I was a bit cooked out by the time i’d got to it so went for what I thought was a simple option. Sole Meunier should have been a piece of cake however my extremely well cared for circulon frying pan decided that it was not going to give up that damned fish – what should have been an evenly brown and crisp skin remained on the bottom of the pan. The other fish was cooked in an old Sainsbury’s frying pan that had been relegated to the garage and while it stuck a bit, at least gave me one good looking finished dish. If anyone knows of a truly non-stick frying pan please let me know. 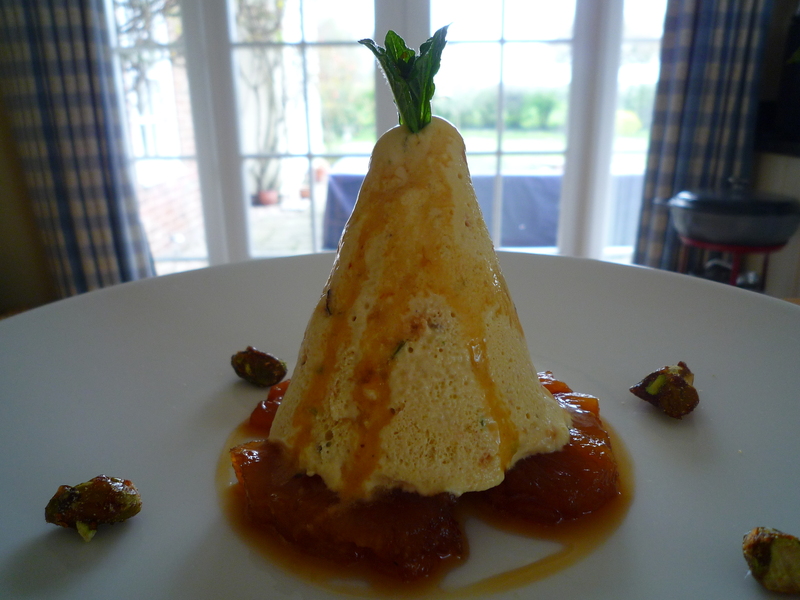 There’s no photo of this one as frankly it looked terrible, but thankfully tasted wonderful. We drank a 2004 Saint-Aubin premier cru from Jean-Pierre Ponnavoy. Rinse the mackerel fillets in cold water and pat dry with kitchen paper, Sprinkle both sides generously with S & P and place in a dish. Cover and refrigerate for 1.5 hours. Rinse the fillets to remove the salt, pat dry and check for small bones and remove. Remove the skin and cut into 5mm dice. Put the diced mackerel into a bowl with the shallots, lemon zest, dill, capers, creme fraiche and olive oil. Mix gently and season. Cover and chill. Halve, stone and peel the avocado then roughly chop the flesh. Blend with the lime to a smooth puree and season. Cover and chill. When ready to serve, spoon the mackerel tartare into the centre of the plates. Top with a quenelle of avocado puree and top with a sprig of dill. Drizzle with olive oil. Categories: Food | Tags: Chris Horridge, East Anglia, Jason Atherton, Kelvedon, Lemon sole, Little Fish Shop, Mackerel, Scallop | Permalink.